Our rustic venue, nestled discreetly in the Rocky Mountains, provides a truly memorable experience. 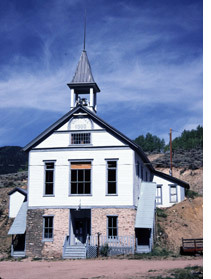 The Town Hall is located in the Town of Pitkin, CO at 9,241 feet in the Gunnison National Forrest. Our pristine views are breathtaking. We pride ourselves on the historical preservation of our exceptional Town Hall, with beautiful stained glass, hardwood floors and open airy space.